3D photogrammetry has been a hobby horse for ages, and I’ve been really excited to watch it grow from an experimental idea  to a full-blown industrial tool. It took a really short time from research to production for this stuff. Agisoft Photoscan turned up in 2009 or 2010, and we all went nuts! It is cheap, super effective, and cross-platform. And then along came a bunch of others. Back to the topic – for my PhD research I was tinkering with the method for a long time, since I had a lot of airborne imagery to play with. I started by handrolling Bundler + PMVS, and then my University acquired a Photoscan Pro license – which made my life a lot simpler! My question at the time was: how can we apply this to sea ice? or can we at all? 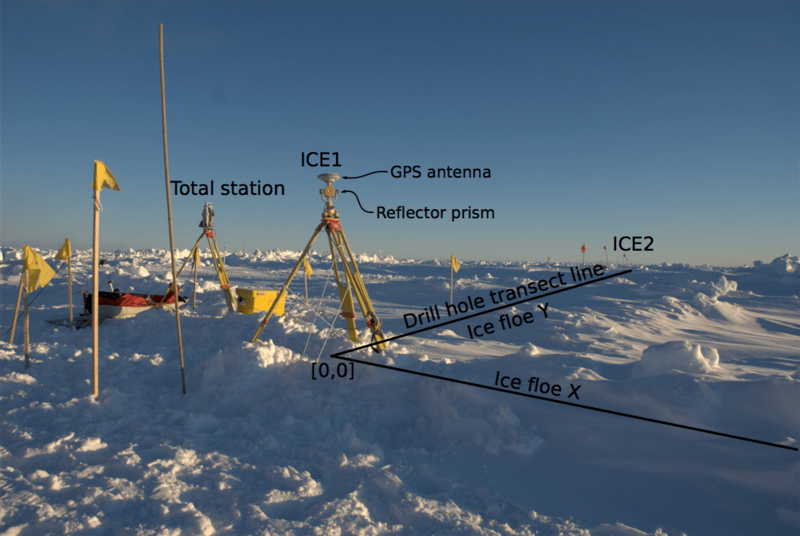 Next, stacking up elevations with in situ measurements from drill holes from a 100m drill hole line on the ice. The constant offset is a result of less-than-great heighting in the local survey – I focussed heavily on getting horizontal measurements right, at the expense of height. Lesson learned for next time! And finally, checking that we’re looking good in 3D, using a distributed set of drill holes to validate the heights we get from photogrammetric modelling. All looks good except site 7 – which is likely a transcription error. I don’t know if this will ever make it to publication outside my thesis – I think the method should be applied to bigger science questions rather than just saying ‘the method works and we can publish because nobody put Antarctica in the title yet’ – because we know that from other works already (see  for just one example). can we use this method to extract ridge shapes and orientations in detail? can we differentiate between a snow dune and a ridge using image + topographic characteristics? These are hard to answer with lower-density LiDAR – and are really important for improving models of snow depth on sea ice (eg ). Dr Jan Lieser (University of Tasmania) instigated the project which collected the imagery used here, let me propose all kinds of wild ideas for it, and was instrumental in getting my PhD done. Dr Christopher Watson (University of Tasmania) provided invaluable advice on surveying data collection, played a massive part in my education on geodesy and surveying, and also was instrumental in getting my PhD done. Dr Petra Heil and Dr Robert Massom (Australian Antarctic Division) trusted me to run logistics, operate a brand new (never done before in the AAD program) surveying operation and collect the right data on a multi-million dollar investment. The AAD engineering team got all the instruments talking to each other and battled aircraft certification engineers to get it all in the air. Helicopter Resources provided safe and reliable air transport for instruments and operators; the management and ship’s crew aboard RSV Aurora Australis kept everyone safe, relatively happy, and didn’t get too grumpy when I pushed the operational boundaries too far on the ice; and Walch Optics (Hobart) worked hard to make sure the total station exercise went smoothly.